Over hills and mountains and to Americay! I have to admit, of all the wonderful spirits out there, for this Booze Nerd, nothing quite satisfies like a wee dram of the stuff, or a sip of rye, or a belt of corn liquor. I’m talking, of course, about whiskey. Okay, my Gaelic is terrible, but I think you can see where we got our English word whiskey. Eventually, whiskey made its way to Scotland where they dropped the “e” and called it whisky, and we now mostly know it as Scotch. Then it traveled with the waves of Celtic immigrants to American shores, where barley was hard to grow so they used rye and corn instead to get their beloved dram. Whiskey is ubiquitous. You can find it in just about every home bar, dive bar, posh restaurant and broken-hearted ballad. In the western world, perhaps, no other spirit captures the wistful memory of homeland or the adventurous spirit of pioneers better than whiskey. Every whiskey is different, but the basic process for making it remains roughly the same. Get a jumbo quantity of barley, spread it out on a large stone floor, and trick it into germinating by steeping it in water. This begins converting some of its starches into soluble sugar, a process known as malting. 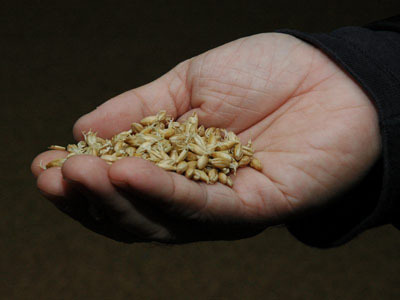 You don’t want the barley to germinate all the way, though, so you halt the malting process by drying it out. Traditionally, this was done in a building called a kiln, and a fire would be lit under the stone floor with holes to allow the air to rise. In the old days, peat was used to fuel these fires, and its characteristic smoke would permanently flavor the barley. Scotland is famous for its smoky, oily drams while Ireland is not known for its peated malts these days (Connemara Peated Irish Malt being an exception). Of course, whiskey can be (and is) made with other grains like corn (maize), potatoes, rye, and oats, but the traditional grain of choice was barley. Modern whiskies do sometimes use small amounts of these grains to impart specific characteristics — for example some Irish drams use a little bit of corn to make their whiskies sweeter and lighter. When you see the words “Single Malt” on a bottle, though, that means the distiller has used only a single type of grain in the production of that whiskey. The malted barley is then milled to a specific grind, and added to a mash tun (a huge vat) with hot water poured in—this is known as the grist. This stews a bit until all the starches are fully converted to sugar. This sugar juice is known as wort. Several (usually three) worts will be poured to captured all starches and sugars possible. The first and second waters are added while the third is kept to wash out the next batch of grist. The worts are cooled and pumped into fermenting vessels called washbacks and these are made from either steel, Oregon pine, or Scottish larch. Yeast is added and then the fermentation starts. These washbacks literally shake, rattle, and roll as the ferment bubbles. Astute readers may realize that so far, the process of making whiskey is pretty much the same as making beer. In fact, when the fermentation process ends, the worts is more or less a weak barley beer you could drink if you wanted. But why stop there? We’re after whiskey! The worts is piped away into huge copper pot stills and distillation begins. In most whiskies (and Scotches) the worts is distilled twice. In Ireland, they distill whiskies three times, though this is more by tradition than law. This tends to result in much lighter whiskies than their Scottish neighbors produce. Next, the whiskey is placed in oak barrels to age. Traditionally, these oak-casks are recycled oloroso sherry casks from Spain, but ex-Bourbon casks are in wide use in the modern era. Some brands use other types of casks, with ex-rum barrels being a popular choice for the sweet, light flavors they impart. So that’s just a quick introduction to uisca beatha. Next time, I’ll talk about Irish whiskey in more detail. In the meantime, get your feet (and your whistle) wet with one of the most classic of cocktails, the Manhattan. One of the earliest cocktails (thought to have originated in the mid 1800s), it’s also in this Booze Nerd’s opinion, one of the best. The recipe traditionally calls for rye whiskey as the base spirit. The blend of sweet and dry vermouth help balance out the bold spiciness of the rye which can be overwhelming if you’ve only had bourbons. Adapted from Gary Regan’s The Joy of Mixology. Stir with ice and strain into a chilled Old Fashioned glass. Garnish with a brandied cherry. If you’re feeling adventurous, try making your Manhattan with Irish whiskey (aka The Paddy Cocktail) but use 1 oz. sweet vermouth and several more dashes of angostura bitters. Irish whiskey is much milder than rye so you may have to experiment to get the balance you like. Substitute blended Scotch instead and you have another classic, The Rob Roy. 5 Responses to Whiskey, You’re the Devil! What’s the difference between dry vermouth and sweet vermouth, anyway? Vermouth is a fortified/aromatized wine. Sweet varieties are just that — “sweet” and are usually reddish in color. Dry varieties more astringent, perhaps a little more bitter and are pale in color. Aha! (You can tell I am way out of my knowledge base with this sort of thing). You know, I don’t even drink, but I get excited when I see one of your posts! Interesting, as always!